. The first year, the goal was to create and collect 100 quilts to donate locally to children in need of some extra comfort. By the second year, several hundred quilts were made and donated. I'm sure the quilt drive will be even a bigger success this year. It's very easy to participate. Simply make a quilt, donate it (locally if possible), and post a photo in the "Link Up" party, which also enters you to win a few fabulous prizes which are listed on Katie's blog. For my quilt for donation, I decided to use my Quilting Bee Blocks from the Twice Around the Block Virtual Quilting Bee which wrapped up earlier this year. 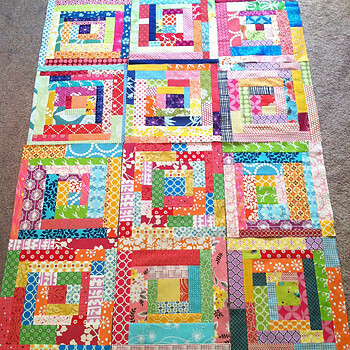 I sent a lot of bright fabrics to my bee group and asked them to make scrappy log cabins. I posted a photo on Instagram asking if people thought I should finish with sashing or no sashing - the vote was for no sashing and I think it looks great for a child, lots of color! The back is a collection of fat quarters and a half yard from my stash. 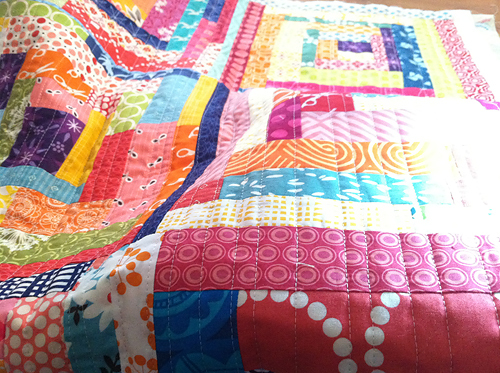 The quilting is straight lines, randomly spaced between 1/4" and 1". Some ideas of places to donate quilts are Project Linus, Wrap Them in Love Foundation, Newborns in Need, the (not related) Quilts for Kids organization, your local women's shelter or your local hospital. If you are still stumped, check with your local quilt shop and I am sure they know of organizations in your area that need donations. 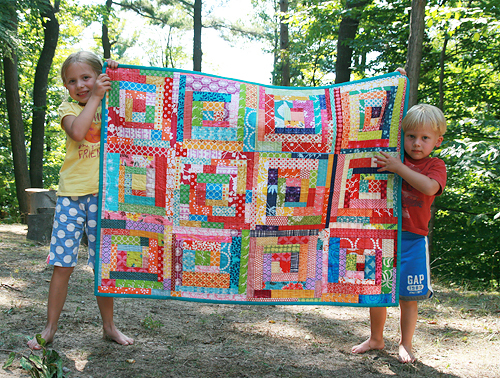 If you aren't sure what sort of quilt to make, Katie is also hosting a quilt along as part of 100 Quilts for Kids. 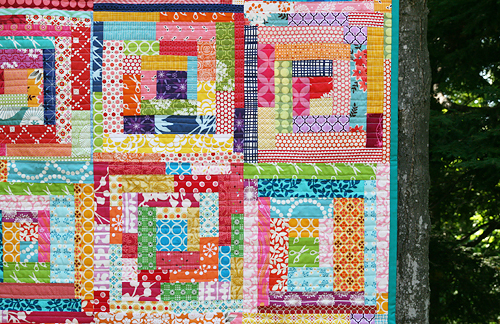 And finally, don't forget to post photos of any finished quilt for the drive in the Flickr Group.